Our 4" Filter Media Cup will replace all those filter socks you have hanging around. Made out of a BPA free Polypropylene, this 4" Filter Media Cup is a solid one-piece design, that holds any filter media. The opaque color will easily hide any blemishes that may occur from changing out filter media. The round design allows the Cup to slide into place, regardless of which “side “slides in first. The cup fits most round filter sock holders intended for use with 4" diameter filter socks. An optional Filter Media Cup Adapter is available to accommodate C shaped filter sock holders or those with slightly larger diameter holders. Simply drop the Filter Media Cup into your sock holder or filter tray, and fill with desired filter media. The beauty of the cup is you can use a wide variety of media types including filter pads, filter floss, carbon, GFO and biological filter media. To clean just replace your filter media as needed. You will no longer need to rinse and house used filter socks. Material: 100% Virgin BPA free Polypropylene (typically used in Tupperware). Material Certs. are available upon request. Note: GFO, Carbon, and other chemical filter media should be placed inside a media bag to prevent media from exiting the filter cup. Our Filter Media Cups are designed to fit sumps that use standard 4" filter socks. The Filter Media Cups do not fit inside Trigger System sumps using Single and Dual filter socks but will fit into the larger Trigger Systems sumps with a Triple filter sock holder. As a precaution, we do recommend a thorough rinse with vinegar and water before placing into your filtration system. If you`ve ever used filter media inside a filter sock you know how water tends to bypass filtration materials like activated carbon and GFO. Maybe you`ve even given up using filter socks, leaving your filter frame unused. 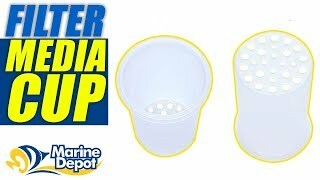 Why not switch to the Filter Media Cup instead? The cup is designed to drop into a filter sock holder. The bottom of the cup has large holes so water flows freely through the media. The media cup works like a mini reactor. There are several ways to use the media cup. You can fill it with bagged filter media, like activated carbon. It`s possible to use several types of bagged media, like GFO and resins at the same time. Putting a layer of filter floss or sponge on top of the media helps to evenly disperse the water and prevent channeling. Biological media works too. We really like how easy it is to rinse fresh filter media, like activated carbon or resins. Just place the loaded filter cup under running water. Your hands stay clean and the media is washed and ready to use. The filter cup is injection-molded in the US using food-grade, BPA-free polypropylene plastic, so no worries about being reef-safe. Give the cup a quick rinse with vinegar to remove any traces of mold release before use. An optional Filter Media Cup Adapter is available to accommodate C shaped filter sock frames or those with slightly larger diameter holders. This Filter Media Cup opens up new opportunities to enhance your filtration system. You can even switch back and forth between a micron filter sock and specialized filter media for the best of both worlds. The cup and adapter ring fits most sock holders. If your curious if it will fit your sump, contact us and we`ll be happy to check! None. Who wants to wash filter socks. Was tired of washing my filter socks once a week in the washer with bleach, then hanging them out to dry. These are amazing. I use Red Sea carbon, filter pads, and purigen in the two media cups I have. Purchase 2 cups to replace my filter socks. the cups could not support the flow of water. I had 1/2 cup of carbon in one and 1/2 cup of gfo in other using media socks. the water flow over and around cups.not enough holes to support flow. Fits Red Sea Peninsula 650 Sump perfectly! Going going gone - no more filter socks.